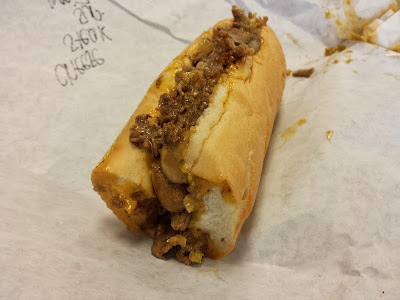 There is lots of praise on the internet for the cheesesteaks at Brianto's Original Hoagies in Avalon Park. I tried them once a while back and was not impressed at all. The cheesesteak was extremely dry and didn't really have any standout characteristics. Recently, I decided to give them another visit and this time around was a bit better. I had the 6 inch Cheesesteak Supreme, consisting of thinly sliced beef, onions, peppers, mushrooms, and cheese wiz. The sandwich was good enough and wasn't horribly dry like on my previous visit, but it still didn't have any standout characteristics that made me proclaim it was the best cheesesteaks in Orlando. I had dinner one evening at Goodfella's Pizzeria in Orange City. I had heard good things for a very long time about their other location in Orlando, but never got a chance to give them a try. This newly opened location in Orange City seemed to be very popular. There was a half hour wait to eat when I arrived on a weeknight. 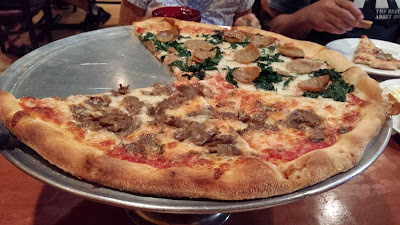 I split a pizza at Goodfella's. 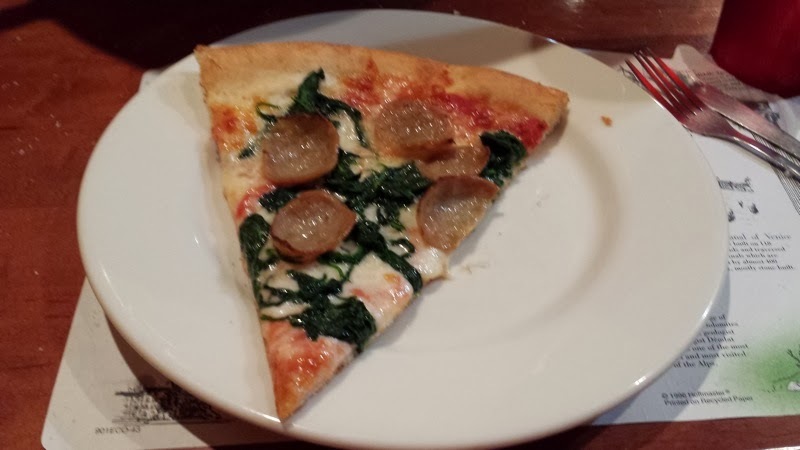 My half was topped with spinach and sausage while the other half was topped with meatball. Another pizza was ordered at the table that was half Hawaiian and half cheese. The overall consensus at the table was that the pizzas had potential, but were undercooked and were too heavy on the cheese. My toppings also made my half of the pie a bit soggy as well. Driving back towards Florida along I-95, I stopped for lunch at a restaurant called Lone Star Barbecue & Mercantile in Santee, SC. This place was located in a complex of several old wooden houses right outside of Santee State Park. Lone Star offered both a menu to order from as well as a buffet. I decided to try their buffet. My first plate of food samplings included pulled pork, collards, black eyed peas, macaroni & cheese, tomato pie, and corn fritters. Most of the food on the plate was tasty. The pork was nice and tender. The corn fritters were on the dry side. The tomato pie was an interesting food that I had never tried before. It was basically layers of bread and slice tomatoes, baked together in a creamy sauce. It was interesting, but not something I'd go out of my way to order. Second plate included fried chicken, rice topped with some sort of pork stew, lima beans, cole slaw, and hush puppies. Chicken had good batter. The hush puppies were definitely better than the other corn fritters that I tried on my previous plate. For dessert, I tried some blueberry cobbler, banana pudding, and chocolate pudding. The blueberry cobbler was definitely the best of the three. 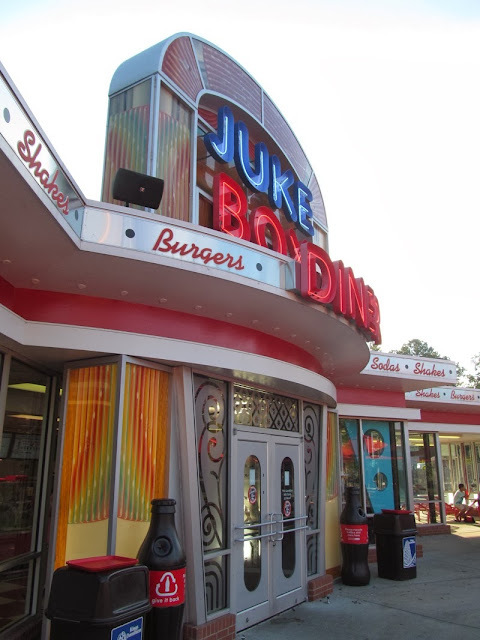 Kings Dominion mostly had fast food chains for their dining offerings. I chose not to visit any of the chains and ate at a restaurant called Border Cafe. 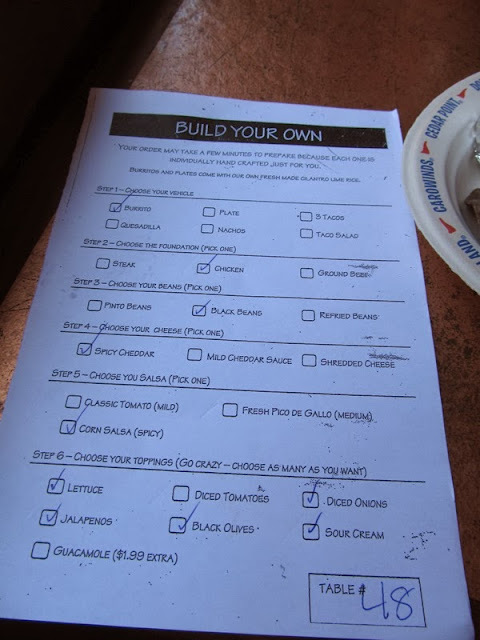 This Mexican themed restaurant worked by everyone filling out papers with what they wanted by checking off boxes. I ordered a burrito with chicken, black beans, spicy cheddar, spicy corn salsa, lettuce, onions, jalapenos, black olives, and sour cream. The burrito was served with a side of tortilla chips. I can't say this was very good theme park food. I guess I'm spoiled by the food in the Orlando parks, but this was pretty bad. The tortilla wrapping up the burrito was very stale tasting. Not only that, it was dry and crunchy as opposed to the moist and soft that it should have been. The rice also had a similar problem, being crunchy as opposed to moist. As for the items that I checked off when ordering, salsa was completely missing from the burrito. For the cheese, the burrito was filled with cheese sauce, although I cheddar sauce wasn't checked. Perhaps I would have been better off going to one of the chains in King's Dominion after my burrito at Border Cafe. 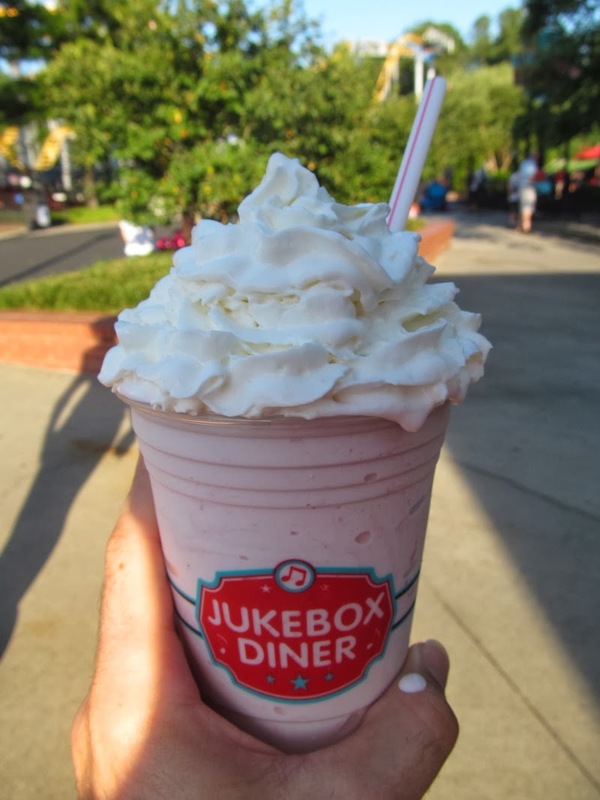 Later in the day, it was time for a snack so I got dessert from another one of the park's non-chain restaurants called Jukebox Diner. This place was themed like a 50's diner and served mostly burgers. I ordered a strawberry milkshake here. I was actually a bit impressed with the milkshakes here. A milkshake like this outside of a lower end theme park wouldn't be that impressive, but I was surprised given the location. They actually made these to order as opposed to using the somewhat pre-made milkshakes that I've seen elsewhere. The shake was filled with lots and lots of strawberries and was topped with a mountain of whipped cream. 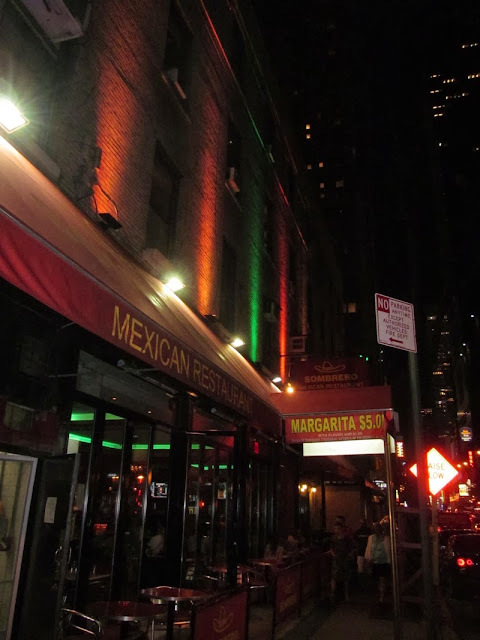 Late one evening while wandering around New York, I had dinner at a Mexican restaurant called Sombrero in Midtown Manhattan. The meal started with some chips and salsa. Sombrero was a bit stingy with these. The basket of chips was pretty small for two people and there was no offer of refills. I ordered the Enchilada De Mole. This consisted of braised garlic pork enchiladas topped with mole sauce and toasted sesame seeds. The two enchiladas were pretty tasty. The shredded pork stuffed inside the tortillas was nice and tender and had plenty of flavor. The mole sauce was slightly spicy and the squirted sour cream sauce zig-zagged over the enchiladas made for a nice presentation. Rice and refried beans accompanied the enchiladas. Both were perfectly acceptable, but nothing to write home about. I enjoyed my meal at Sombrero. It was sort of overpriced for what Mexican food normally goes for with my enchiladas costing $17. Then again, Sombrero was located only a few blocks away from Times Square so maybe they have the high prices for the tourists (and they apparently got the tourist money from us).